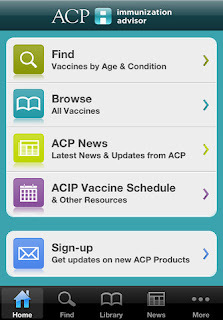 ACP Immunization Advisor is a free app for the iPhone and iPad that delivers the latest immunization recommendations from the American College of Physicians (ACP). Immunization Advisor is an easy to use and professional quality medical app. Immunization Advisor is an excellent and authoritative resource for any healthcare professional with an iOS device.